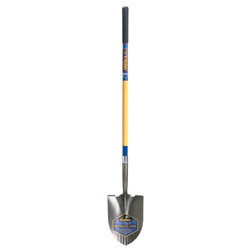 Serrated blade for easy soil penetration. Large steel collar for added strength. Dual diameter grip inside poly sleeve provides barrier between handle and grip. Outside, soft cushioned grip provides added comfort and control. Heavy-duty contractor grade fiberglass handle is stronger than wood. Tool Type: Spade; Application: Farming; Gardening; Landscaping; Applicable Material: Clay; Gravel; Sod; Soil; Style: Serrated Round Point.